As I mentioned in my introductory post, I'm hoping to share recipes here on the new blog and what better place to start than today? I have to confess I'm no chef, but thanks to all of the amazing blogs and YouTube channels that share plant-based and free from ideas I have really been enjoying experimenting with new recipes over the last few months. This spaghetti recipe was something I made for lunch recently after digging through the fridge for vegetables and not finding much in the way of my usual pasta sauce favourites! Luckily it turned out to be pretty delicious (there's no dish that can't be saved by pesto!) and made a great filling lunch. It could also be served alongside garlic bread for dinner. Add chopped cauliflower, brussel sprouts and petit pois to a pan of boiling water and cook for a few minutes before adding the spaghetti (to cook according to packet instructions). Whilst the spaghetti is cooking, heat a small amount of coconut oil in a small pan and fry the onions until clear. Add the garlic, a pinch of chili flakes and fry for another minute or so. 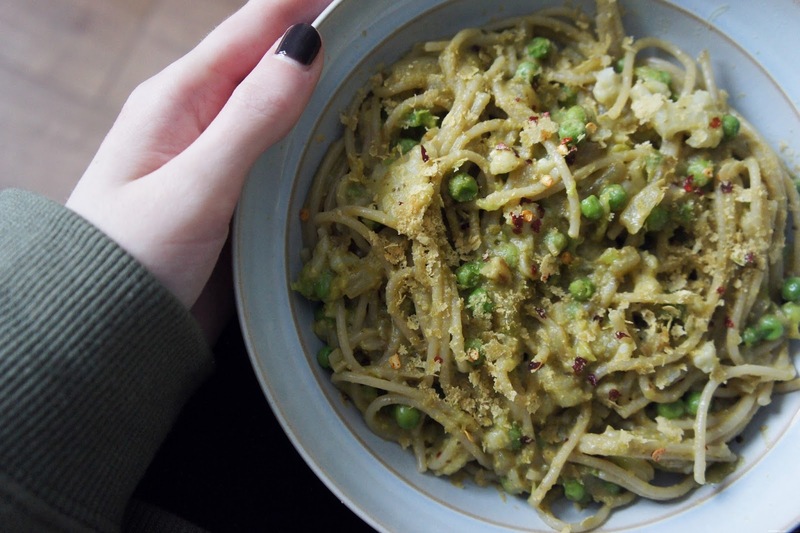 Turn the heat to low and stir in the pesto and oat cream to form a smooth sauce, then leave to heat gently. Once the spaghetti and vegetables are cooked, drain and add to the pesto sauce mixture. Stir until fully combined and heated through, season to taste then serve topped with nutritional yeast flakes and an extra sprinkle chili flakes if you wish.